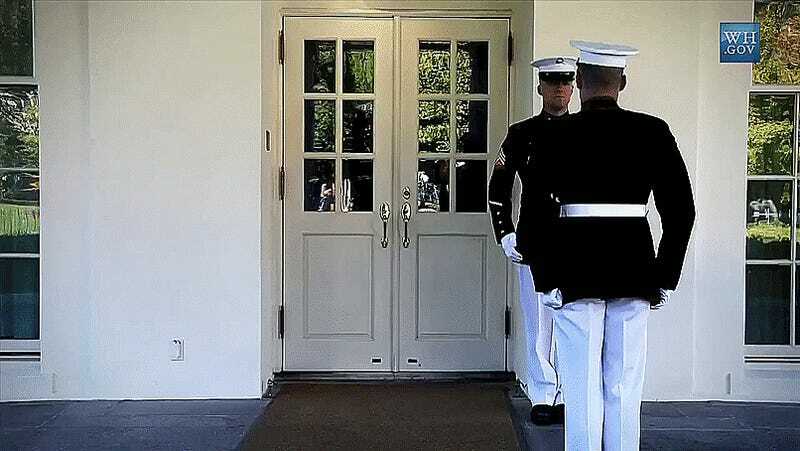 Only four marines in the entire U.S. Marine Corps get to stand sentry over the White House’s West Wing while the president is working. This video breaks down a day in the life of the most badass doorman in America. It looks like the job’s primary requirements are patience, poise, the ability to pass what I imagine is an extremely thorough background check and resist scratching an itch for at least half an hour. Sergeant J.D. Hodges explains that Marine Sentries work 30 minute shifts; half an hour on, half an hour off, whenever the president is in the West Wing for as long as he’s working there for the day. If you’ve ever wondered how a sentry knows when to open the door for somebody while facing the other direction; it’s a buzzer pushed by Secret Service officers which you’ll see in action about a minute and a half into the clip. “I could work at the Waldorf after this,” he adds with a laugh. The role of a marine sentry may not be as dangerous as an overseas station on a daily basis, but it sounds like the role is a tremendous honor for the few marines who have the privilege of serving in it.